Use the Discipline tab in the top navigation menu (#1 in image) to select a discipline. The Disciplines will be listed below the menu option (#2). Notice over to the right of the Discipline list, will be sub-categories, known as Communities (#3). Communities will each have their own (varying) pages with featured information about the content. After selecting the Discipline, users will see a page similar to the one, right. 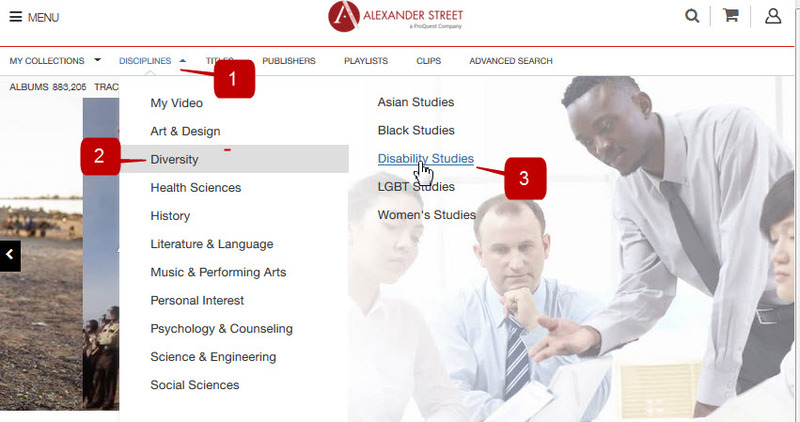 In the center is a description of the discipline with a search box (#1 in image) to allow users to search within that content. To the right of the search box is a link to the Advanced search page (see Advanced Search page in this guide for more information). To the left on the screen (#2) is a list that allows users to browse by title, disciplines, people etc. 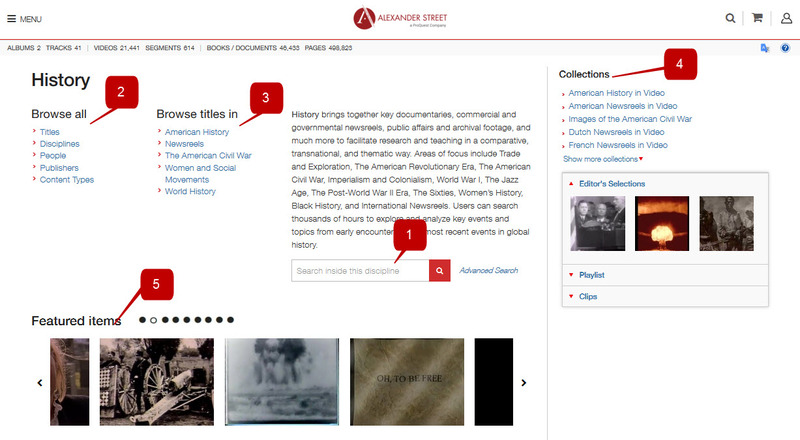 The Browse Titles links (#3) allows users to browse all the titles in the Communities that make up each Discipline. On the far right (#4) are some of the collections that make up the Discipline, and just below that are Editior's Selections - individual titles, playlists, and clips. Finally, at the bottom, are featured titles (#5).